Experience the powerful effects of vibrational healing as harmony is reestablished to all levels of your Being. A session will be tailored to fit your needs. As a Master Sound Healer, Reiki Master, Lightbody Practitioner and Spiritual Healer, Reverend Elivia uses channeled spiritual healing and crystalline sonic frequencies to clear, align and balance all conditions. Vibrational healing is really very simple, for those who offer themselves up as healers and know how to attune themselves to the correct frequencies necessary for wholeness. No one person ever heals another. Elivia acts as a channel to access the necessary healing energies for that individual. For any and all healing to be effective, the only requirement is a desire for healing and the ability to be open and receptive. Sessions may also include Bach flower remedies, aromatherapy, sound therapy, and crystal healing. Our bodies are vibrating fields of energy, governed by energy centers, called chakras. When those fields get out of balance the result is mental, emotional, physical or spiritual stress. 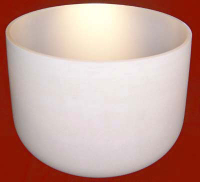 The attunement begins with a tune up for the entire energy system using selected singing crystal bowls. 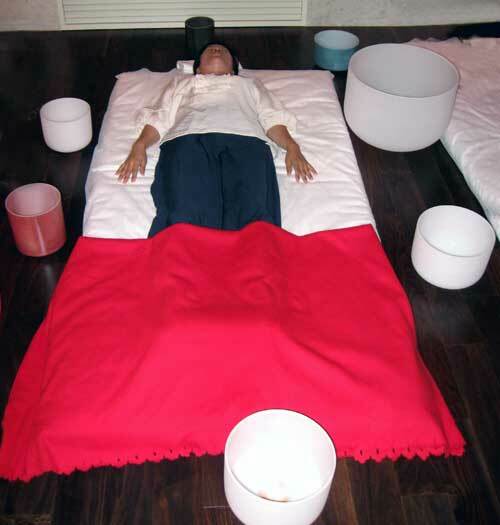 After, a specific sequence of crystal bowls are selected and sounded individually or together to activate and align the body energy centers until all are harmonized and attuned. Clients may recline, sit or stand, depending on the individualized treatment necessary. Each client is different, so each session will vary. Toning, vowel sounds, rock energies, and other tools may be used to augment and enhance the healing energies. 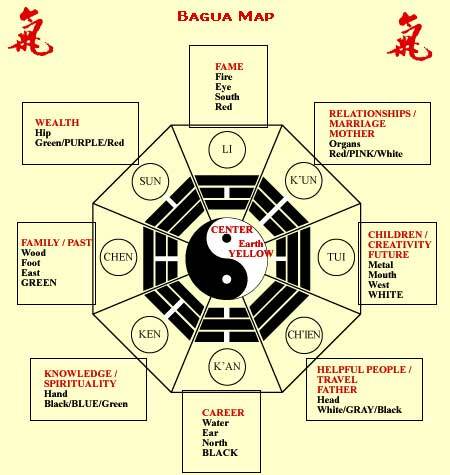 The Bagua Map outlines the eight major areas of your life, which Space Clearing will directly affect. Cleansing, clearing, and energizing with a Crystal Singing Bowl Space Clearing will increase the flow of positive energy to these areas of your life. A Space Clearing Ceremony with Elivia Melodey is a wonderful gift to give to yourself, your home or your work space. Space clearing with singing crystal bowls is similar to house cleaning, except you’re cleansing and clearing energy instead of physical matter. The result is the same clean and fresh feeling that will bring with it optimism, increased vitality and a sense of sacred space. Elivia’s Crystal Sound Space Clearing Ceremony will cleanse almost all spaces. The unique crystal properties of her singing bowls will bring in even greater life supporting energies to all spaces, charging the air with negative ions and raising the vibratory frequency of that space. 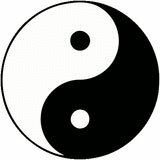 An essential element of Feng Shui, the ancient art of knowing how energies circulate, is space clearing. No Feng Shui consultation takes place without this primary consideration. Otherwise you are simply moving things around in a thick soup of stagnant energy. Energy, which is all around us, can get stagnant and thick, with a gummy, stuck feel to it over time. This can occur everywhere, however we notice it most in the home, office, and work space. This flat energy promotes stagnation, lethargy, dissatisfaction, and boredom. Stuck energy in spaces builds up, holding the vibration of whatever has occurred in that space. Space clearing should be done on a yearly basis for this reason, however it is especially helpful for releasing earthbound spirits or ghosts, entities, as well as negative past situations from illness, emotional conflicts, mental instabilities, and addictions. Whenever you wish to bring change into your life, to birth new energy, sell or christen a new home, work space, or new property it is especially helpful to have a space clearing. Space clearing helps with manifesting more abundance and prosperity on all levels: financial, emotional, mental, and spiritual. It can increase the flow of money, love, ease, and joy. If you are seeking new opportunities and renewed energy in your personal or professional life, a space clearing will lift the energies in your environment to a higher level to set the wheels in motion to manifest. The Law of Vibration states that “Like Attracts Like.” When you have a Crystal Sound Space Clearing Ceremony performed, you literally are magnetizing this space to attract the highest possible energies to support you in all ways. Space Clearing with singing crystal bowls brings renewed and balanced energy for manifesting more abundance, health and prosperity on all levels. As a Spiritual Medium, Elivia is able to use her sensitivities to tune into the energy of your space, release what no longer supports you, cleanse and charge the energy, as well as set up a system for constant flow of beneficial energy. As a Master Sound Healer with crystal singing bowls, Elivia is able to heal fragmented energies, release negative influences, and bring your space into congruence for optimum health and wellness. The specific frequencies of her quartz crystal and Alchemy singing crystal bowls along with bells, intention and specialized programmed crystals, make her sound clearing ceremonies so effective. After a Crystal Sound Space Clearing Ceremony you will feel renewed, energized, optimistic, and creative! Best of all there will be a positive flow of moving energy in your life. This service is only offered to people in North San Diego County. To schedule a Space Clearing Session, click here. Elivia's magic with her sound healing is beyond compare. Elivia's school of sound was amazing. I meditated in a room, and floated with the angels. It was an amazing experience. I was at school today. I told you I gave the baby class your CD to use. OMG... Elivia, the teacher said the difference the CD makes is AMAZING!!!! All day I did NOT hear those babies crying. She said if they start to get fussy, she puts the CD on and they calm down!!!!! On behalf of all the Women of the Temple, may we say “thank you, thank you, thank you!” for your wonderful Priestess Blessing at the Dedication Ceremony last week. It was a day we shall all always remember, thanks to you. Your Crystal Singing Bowls Blessing was so beautiful and powerful … the presence you have is just awe inspiring. It was perfect to start our blessing ceremony with you and to bless our Temple from the outside in … to start. Very meaningful. Thank you for your talent, your grace and your beauty. Thank you for being such an amazing Emanation of the Goddess!!! When I first heard Elivia's music 4 years ago, I couldn't walk unaided. I had a wheelchair for long distances and used a cane the rest of the time. After her concert I walked to my car without pain. Her personal style of energetically connecting with her audience allows for true communication to take place. A succession of Magical, meditative passages, leading to the peace of mind, and meditation, in the purest style of New Age Music with mystic and cosmic touches. The haunting melodies introduce a new musical style that crosses the boundaries of jazz, world music and new age. It is all of these and more. I attended Elivia’s concert at the California Massage & Bodywork Convention in San Francisco. The music was very soothing. Now, I use her CD’s during my massage sessions and have received very positive feedback from it. It definitely does wonders. You and your bowls were amazing! I know words like 'powerful' and 'sacred' are over-used, but, I am not often strongly affected by things. It's difficult for me to be articulate about this experience, but this sound can elevate the vibration of the entire group with ease into oneness with All That Is. The music she channels feels very sacred and seems to continue to resonate in my ethereal body for a long time. Your music was so peaceful and helped clear out any negativity while balancing the chakras. t was a pleasure and a joy to attend your Lake Havasu City concert. I felt "things were done" within me that night and the next morning I was able to "let go" of a relationship that was hurting me. Now, early this (two days after attending your concert) a.m. I was able to write to my mother helping her to see that my relationship with my oldest sister is too painful to continue. Wow! That was a lot of change for me! Thank you for that wonderful concert last night. My husband & I really enjoyed it. I felt alot of energy being processed as we were driving home and this morning I feel better. It was our pleasure to host you. Many have told me that they stayed in a peaceful place for many days. A good friend said she cleared a lot of stuff and has felt so much more energy since that day. Your concerts are bringing healing and joy to so many people. I know it was my best night ever!! My body went somewhere good. Thank you, Thank you, Thank you!!!!! Everyone said that it was a wonderful concert. I really get how you intune with the consciousness in the room and create an original masterpiece each and every time. I know that I want to experience this again. I was lucky enough to be at your crystal bowl healing session last year in Seattle at the East West book store. It was wonderful. I had a very profound healing and was accompanied by an angel for a couple of weeks afterward. Several people saw him. Thank you very much. Thank you so much for sharing your gifts at the Drum Circle in Norco Saturday night. It was my first drum circle and I didn't know what to expect... had never heard a crystal bowl played before and didn't know they existed. Heard and felt the healing influence you facilitated through the bowl and the effect it had on the energy was magical. It was so beautiful and it is so exciting to learn of this musical healing tool. Your music transported me through an inner journey of fascinating visions... extraterrestrial beings transmutating into dolphins -- very surreal and extraordinary. Want to tell you that I got some much out of the last Crystal Bowl concert. My question/intention was totally answered as always, and I had major insights that were bittersweet...ones that my conscious/ego would avoid getting...but am blessed to have gotten. I was left completely aware that I create all of my life...exactly how it is and exactly how it isn't and that I only have what I believe I can have (no more or less). There was lots more insights, but what I wanted to tell you is that I paid specific attention to the sound after the break and what seemed clear to me is that the Gongs were pumping our strong sound vibrations that were traveling through the collective sound of all your bowls and instruments which were between me and the gongs. It was like hitting turbo boost on your playing. The gongs never stood out as a distinct sound to me at all...it was just like some one supersized your sound waves intensity. Like if your were the film and the gongs were a higher watt light bulb in the projector. Thank you so much for the concert last evening. I went away feeling so great and today it feels like spring is really in the air and my air so to speak.....I am very much looking forward to my trip to Arizona now. You somehow made an inner door of joy open about it and I am feeling very positive about my business attempt and also to visit the desert. Tony and I want to tell you how much we enjoyed your crystal vibration presentation last evening at Uki and Gary's home. It was a wonderful experience and a pleasure meeting you. Thank you for the spirit reading also (you were so on). As an adviser, I find Elivia to be unbelievably accurate and plugged in and she really works for the highest and best good of her clients. Elivia Melodey uses a number of tools and skills and always works with an open heart and mind. Definitely a must have speaker, performer, or spiritual adviser. Elivia is not only a business role model, she is an inspiration! We have offered joint events for several years. She has always exceeded my expectations with her professionalism, depth of knowledge, and wonderful sense of humor. Experience Elivia in any of her areas of expertise, and you'll come back for more! Elivia Melodey lives up to her name! Her music is healing, inspiring and beautiful. She is also a very interesting lecturer. Elivia is always extremely knowledgeable about the subject she presents and she presents it in a interesting way. She is a very kind, trustworthy and caring person and she is always a joy to be around. She is an inspiration to many people and has touched many lives. 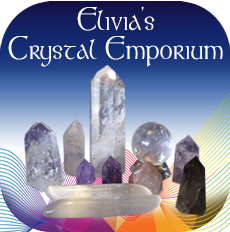 Elivia is a fantastic spiritualist medium and psychic. I've attended her mediumship classes and her circles, so I've seen her give messages as well as provide meditations, classes and sound healings. 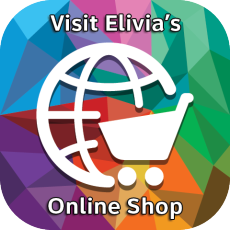 Elivia is personable, kind and also very knowledgeable. A true embodiment of expertise. I highly recommend her and wish I lived closer so I could attend more of her events. I've been around a lot of mediums and do not give such high marks lightly. For students and sitters alike, I highly recommend Elivia. Her talks are always insightful, uplifting, humorous and healing. Elivia’s lectures are always insightful, uplifting, humorous and healing. Elivia Melodey lives up to her name! Her music is healing, inspiring and beautiful. She is also a very interesting lecturer. Elivia is always extremely knowledgeable about the subject she presents and she presents it in an interesting way. She is a inspiration to many people and has touched many lives. Your talk and sound healing was really powerful!!! I am enjoying your Celestial Memories CD and it is helping me a lot with "house Clearing." I took the CD to work, and my students stayed on task and I had no major problems with any of them. I also have a Comfort Clock by Advanced Technology an EMF clearing machine and salt lamp in the classroom but your CD was the "icing on the cake." They were all attentive and not looking to get into "mischief," if you know what I mean. The next day one of the students accused me of "hypnotizing" the class and said "isn't it illegal to hypnotize students." I told her I have not studied hypnotism. What I think your CD did was help clear out some energy, balanced and cleared the room and chakras, and brought in the "Art Angels!" :) Keep up the good work! My chakra meditations have improved! Now, when I meditate, I feel this incredible aliveness, tingling, and vibrancy! I have never felt this energy before. I also feel it in my hands and have begun to "bathe" myself with it, as well as send it out to loved ones and the world at large." I know words like 'powerful' and 'sacred' are over-used, but, I am not often strongly affected by things. It's difficult for me to be articulate about this experience, but this sound can elevate the vibration of the entire group with ease into oneness with All That Is.